Given MJ’s adoration of all things equine, it is a little hard to fathom why we haven’t visited the Plumed Horse before now. It has always been on our list, but not until a few weeks ago did it reach the zone of actually getting scheduled in. On the basis of today’s visit, I wish I’d got my act together a good deal sooner. The Plumed Horse has been dealing with the aftermath of what I imagine is one of the more painful things to occur to a fine dining establishment: the loss of a Michelin star. With Edinburgh and Scotland’s economy so reliant upon tourism, and the Michelin Guide providing an easily translatable culinary currency, I would imagine that the impact on businesses would be felt more keenly in a city like Edinburgh than in many other places, but I guess all at the Plumed Horse will be in the unwanted position of being experts on the matter, in the coming months. Certainly, in terms of numbers through the door, today told a very sad tale. For the first time in all of our quests, we had the run of a restaurant for the entire lunchtime service. From our point of view, this was a rare pleasure. It was great to see the staff approach things which such a welcoming and open attitude, also. From the moment of arrival, I was impressed with the place. It radiated a relaxed and classy quality, much like my dining companion, whom I found seated at a table that allowed her to survey her entire domain. With sparkly water ordered, further sparkly stuff was introduced in the form of a glass of prosecco, which comes as part of the lunchtime set menu. The service throughout was friendly, helpful, relaxed and accurate. We had both staff members who were running front of house to ourselves, right enough, but they made sure that this didn’t feel intrusive at any point. I got the impression that they could have happily managed the entire room with equal efficacy. This was a complete contrast to the battalion we’d encountered at The Kitchin. Fair enough, the guys at The Kitchin have things running very smoothly, but their approach seems bloated and excessive when set against the highly proficient operators we encountered today. MJ, in a rare moment of speedy decisiveness, proclaimed herself ready to order, almost immediately. She did soon admit that this reflected the fact that she’d consulted the menu online, three days before, though. I quickly made my choices, too. With the cogitation completed and orders placed, we were presented with a trio of amuse bouches to tackle. These were dainty little morsels, comprising a ballotine of smoked salmon topped with avruga caviar, a beetroot jelly with topped with creamed apple, and a black pudding fritter. All were excellent, with the smokiness of the salmon outstanding, the contrast of textures in the beetroot and apple well judged, and the crisp coating and warm centre of the fritter really pleasing. 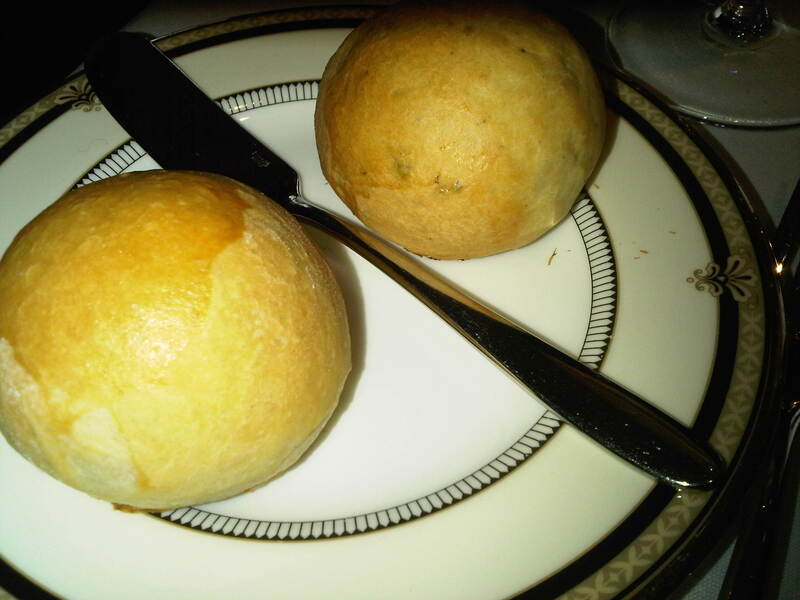 From an excellent opening overture, we moved swiftly to starters, via an interlude with lovely fresh bread rolls, warm from the oven. My plate was very pretty, with a generous slice of ham hock and black pudding terrine dressed with bacon, micro herbs, and dots of richly fruity sauce. I’m not usually a terrine person, as I often find them more of a technical display of cheffy skill than providing a satisfying flavour-filled dish, but this power-packed piece of porky panache was extremely good. 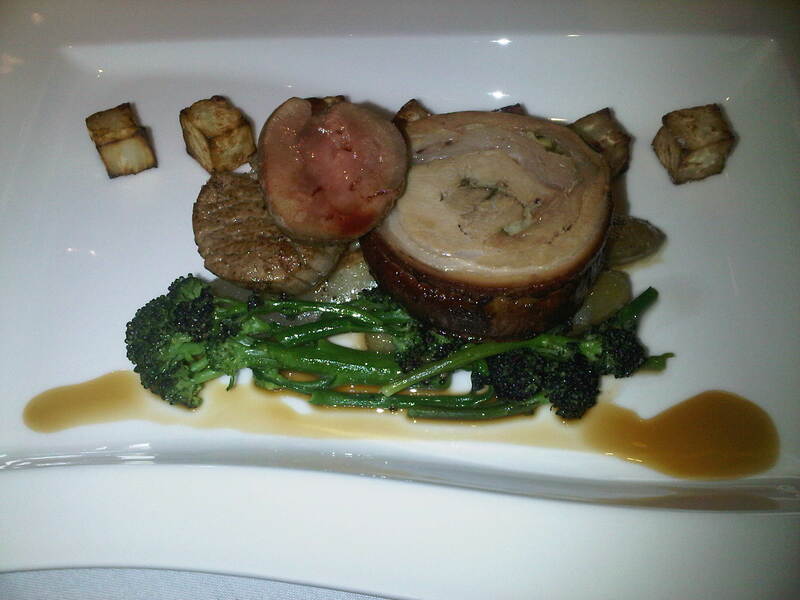 Next up was an eye-catching main of slow braised breast and roast fillet of veal, with kidney, braised shallots, broccoli, mash and cubed celeriac. It was a properly lovely combination of flavours, with each element expertly executed and the whole dish together providing mouthfuls of simple, tasty goodness. I think I fared a little better than MJ, as from the little taste of her risotto that I had, it was a touch too al dente for my tastes, and could have used a twist less salt. To conclude, I opted for the cheeseboard, which was to the same high standards as the rest of the meal. Four cheeses were served with crispbread, apple chutney, quince jelly and apple slices. The pungent Welsh Celtic Promise was particularly good. Coffees and petit fours rounded out what had been a really enjoyable lunchtime experience. Overall, the Plumed Horse is simply excellent. Their lunchtime deal of three courses, plus a glass of prosecco, for £26.50 is very good value given the quality of the dishes on offer. For me, it’s right near the top of places I’d like to visit on a frequent basis, places I’d take people who are looking for top quality cuisine, and places I’d recommend others to visit. The fact that we were the only customers today was brilliant for us, but an absolute tragedy for everyone else who wasn’t there to bask in the glory of a fantastic dining experience. I have to say that I thought awfully hard about wearing my brown and pink polka-dotted wellies to lunch on Tuesday, and if there was ever a day they would be allowed, that was it. But in a sudden fit of not letting the weather get the better of me, I pulled on my blue ostrich boots from LaGrange Leather (which have served me so well). After all, we were going to The Plumed Horse… and one needs take pains to dress appropriately for such occasions. I arrived a bit early and was greeted by a very friendly waiting staff of two, who took my coat, chatted to me about the silly snow, and allowed me my choice of seats. I chose a lovely table in the corner so we could observe the room. B arrived as prompt as ever and was soon catching me up on his recent visit to the wild west. First, I think I should say that the restaurant itself is the best decorated and most welcoming of all the posh places we’ve been this past year. The warm, yet bright colours and openness of the large ceiling height and many windows made me feel like I was in a great room circa 1886, and I really liked it. I knew what I wanted before I arrived, putting their menu online allows wishy-washy diners like me to choose well before hand and I already had my mind set on the Marrbury smoked salmon, white crab meat, dill pickled cucumber and Avruga Caviar followed by the baked fillet of monkfish, herb and leek risotto and a shellfish veloute. We were brought out glasses of Prosecco, and a trio of amuse bouches. The ballotine of smoked salmon with caviar was my favourite. The rich smoky flavour of the salmon came through the smoothness of the ballotine itself, set off by the barely salty bite of the good quality caviar. The beetroot jelly and creme fraiche apple mix on top was an interesting combination of textures, but the tastes were a bit tame. And, B rather enjoyed the wee haggis balls. At this point, we accepted that we were the sole people braving the weather to have a fine dining experience and we had the run of the restaurant. The service was attentive, but not obtrusive, and soon our starters arrived. B’s terrine looked impressive and of a higher quality than the meat terrines that I am accustomed to, and my smoked salmon was excellent. The softness and light flavour of the crab combined well with the pickled cucumber and the caviar made for a refreshing and light mouthful, but I would have liked the option of a bit of lemon to give it that bit of extra zing. Before long, our mains arrived, cooked by the well-known chef himself. My baked fillet of monkfish was substantial, with a lovely colour and aroma. The monkfish was well cooked and was as good as any monkfish I’ve had. However, the risotto upon which it sat was a touch too al dente and the crunch of the rice was an odd sound in my ear. The risotto, sadly, was also over-seasoned to the point of me debating whether I wanted to eat all of it. I carried on, but would not order a risotto again. One of the things I rather liked about the Plumed Horse is the option to forego desserts and have tea or coffee with petit fours. I ordered an Americano while B had a cheese board that didn’t arrive on an ornate trolley, but looked well judged and tasty. I was offered refills on my coffee (which is a lovely touch that I really appreciated), and soon we were getting the bill and heading out into the wild weather back to our respective occupations. 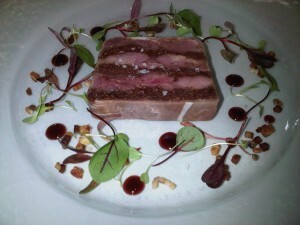 Overall, I was pleased with the atmosphere, the staff, the whole experience, barring the issues with my main course. I’d happily go back, but would never again order the risotto. We wore: black shirt (that really should have been augmented by a red patterned www.tieclub.co.uk, if only I’d remembered), snow-soaked grey pinstripes. Michelin stars really mean nothing if you have an empty restaurant !!!!!!!!! !